When using your Google Apps SMTP server to send emails, there are limits that might prevent Method from sending your emails. 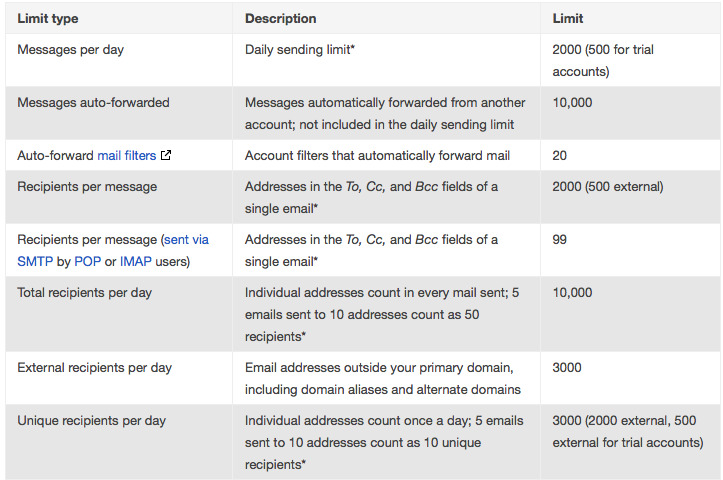 To keep their systems healthy and your accounts safe, all Google Apps accounts limit the amount of mail a user can send. The limits restrict the number of messages sent per day and the number of recipients per message. After reaching one of these limits, a user cannot send new messages for up to 24 hours. Note: Even if you've reached one of these limits, you can still receive incoming email! The maximum number of external recipients you're allowed to send a message to is 500. Even if you send out multiple messages to break things up, you can only send to a maximum of 2,000 unique recipients per day. Below is a comprehensive list of limits. *Applies to both internal and external recipients.